Non-stop entertainment for the whole family! Get ready for fantastic fun, endless excitement, and high-seas laughs in a dazzling twist on this classic tale. Follow our swashbuckling hero, Sinbad, his loyal canine sidekick Spike, and the daring princess Marina as they battle the Goddess of Chaos and her mischievous monsters to save the life of his best friend. Sinbad is non-stop entertainment for the whole family. $6.874 million on 3086 screens. 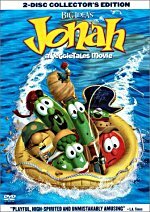 In 2003, one film proved that viewers would flock toward a well-made movie about a pirate. Unfortunately for the folks at DreamWorks, that movie wasn’t their animated adventure Sinbad: Legend of the Seven Seas. While Disney’s live-action Pirates of the Caribbean raked in the megabucks with a gross of an amazing $302 million, Sinbad struggled to earn a mere $26 million. Perhaps that’s because Pirates offered a fresh take on the genre, whereas Sinbad felt like nothing new. At its start, we see a pirate named Sinbad (voiced by Brad Pitt) as he overtakes the ship of Proteus (Joseph Fiennes) to steal his treasure. Old but estranged friends, Sinbad wants to steal a powerful tome called the Book of Peace that Proteus attempts to take back to his father King Dymas (Timothy West) in Syracuse. After Sinbad defeats the creature, Eris meets with him. She promises riches if he can retrieve the Book, so he agrees. When he nabs it, he’ll need to deliver it to Tartarus, her Realm of Chaos. Sinbad heads to Syracuse and meets with King Dymas and the rest. He also meets Proteus’ fiancée Lady Marina (Catherine Zeta-Jones) and immediately becomes smitten with her. Eris impersonates Sinbad to steal the Book, and the authorities imprison Sinbad. Proteus takes his place to allow Sinbad to get back the Book. However, Sinbad plans to head on the lam to Fiji. Marina stows away, though, and bribes him into going to Tartarus. From there, we get an adventure in which they fight all sorts of calamities to find the Book. Sinbad offers one of those movies that mostly seems neither good nor bad. It’s just kind of there, as it tells a moderately interesting tale but fails to ever threaten to become terribly engaging. A lot of the problem stems from the “been there, done that” sense of Sinbad. Very few surprises occur during the brief flick. From the second we see Sinbad with Marina, we feel no doubt how their interactions will develop. The movie does nothing to create life in their relationship. They go through the usual early animosity and disdain until they start to manifest their true feelings for each other. This concept dates back many years, and Sinbad fails to bring anything fresh to it. Whereas Pirates of the Caribbean nicely pays homage to classic pirate adventures and doesn’t stretch to feel “modern”, Sinbad tries hard to come across as fresh and edgy. It provides lots of anachronistic lines and attitude, which means the usual assortment of gross-out gags. We hear an allusion to a dog who humps legs and also get elements about vomiting and a disgusting bit in which the aforementioned canine licks the goo off of an enormous eyeball. These elements don’t really mesh with the movie, and they feel like strained attempts to appeal to an adolescent male audience. The movie does achieve some decent action scenes, though. I especially like one with an enormous fish that Sinbad and company initially mistake for an island. When it comes to life and attacks, the film takes on life and becomes fairly exciting. Unfortunately, scenes of that sort seem few and far between, and much of the flick simply comes across as tedious and lackluster. The animation generally appears decent, but some notable exceptions occur. Like Treasure Planet and a number of other modern movies, Sinbad melds cel animation with computer generated elements. However, it does so very poorly at times. Much of the CG bits stand out to an extreme. Take Eris’s monster at the start of the film; it stands out in a very obvious way and doesn’t fit with the movie’s visual look in the least. Ultimately, I can’t call Sinbad a bad film so much as I think it’s an uninspired one. The movie rehashes many things we’ve seen often in the past, and it fails to give these elements a compelling spin. I’ve seen worse animated flicks, but I’ve also watched many superior ones. 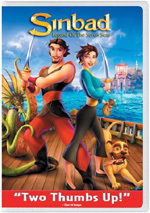 Sinbad: Legend of the Seven Seas appears in an aspect ratio of 1.85:1 on this single-sided, double-layered DVD; the image has been enhanced for 16X9 televisions. Most of Sinbad looked terrific, but it seemed a little below the usual high standards of animated films on DVD. Mostly sharpness appeared fine. The majority of the flick came across as distinctive and well defined. However, a few shots looked a little soft. Those instances failed to cause significant problems, but the image was just a little fuzzy on some occasions. Jagged edges and moiré effects caused no issues, and I also noticed no signs of edge enhancement. As for print flaws, the movie showed no examples of any. Sinbad featured pretty wide palette that came across nicely on this DVD. The movie demonstrated wonderfully lush and vibrant colors consistently throughout the film. The hues seemed vivid and appropriately saturated, with no issues of any sort related to them. Black levels also came across as deep and rich, but shadow detail was slightly problematic. Low-light scenes came across as a bit dense and seemed somewhat hard to discern at times. Those weren’t major concerns, but the definition in those shots was less than stellar. Overall, Sinbad presented a strong enough image to merit a “B+”, which put it below the levels of the better animated DVDs. On this disc, we got both Dolby Digital 5.1 and DTS 5.1 soundtracks. Based on my comparisons, I noticed no substantial differences between the pair. As often is the case, the DTS mix was noticeably louder, but when I adjusted for volume variations, the two seemed virtually identical. Overall, Sinbad offered somewhat subdued but fairly satisfying piece of work. For the most part, the mix remained oriented toward the front channels. Music showed nice breadth and stereo imaging, and effects demonstrated good movement across the spectrum. Elements appeared appropriately located in that domain, and they blended together well. As for the surrounds, they seemed surprisingly restrained. The rear channels offered a decent sense of boat atmosphere, and they added reinforcement to effects and music. Otherwise, however, the surrounds lacked much unique material. On at least one occasion, a monster stomped around the rear in a fun manner, but most of the action sequences didn’t take great advantage of the possibilities. The surrounds supported the front action but didn’t create much life of their own. Audio quality appeared positive, which helped balance out the moderately lackluster soundfield. Dialogue came across as natural and warm, and I noticed no signs of edginess or problems related to intelligibility. Effects sounded crisp and distinct. They showed no distortion and they packed a nice punch when necessary, and bass response was strong. The score also presented good range, as the music appeared rich and dynamic. Ultimately, Sinbad lost some points due to a somewhat restrained soundscape, but the track appeared strong enough to merit a “B”. For the DVD release of Sinbad, we find a mix of supplements. These start with an audio commentary from directors Tim Johnson and Patrick Gilmore plus producer Mireille Soria, production designer Raymond Zibach, head of story Jennifer Nelson, animation supervisor Kristof Serrand, and layout supervisor Damon O’Beirne. All seven sit together for this running, screen-specific piece. Given the size of that crew, it seems like a surprise that a smattering of empty spots occur. These don’t pop up frequently, but with so many participants, they become more intrusive than I’d expect. Otherwise, the gang provide a reasonably informative and entertaining chat. They go over usual subjects like variations made from the script to the screen, developing the characters, the influence of the actors, and various technical challenges vis a vis the animation. The directors dominate, but everyone gets in their comments, and the track moves by at a fairly brisk pace. It never threatens to become a truly scintillating chat, but it manages to seem above average, and it consistently holds the listener’s attention. Next we find the 16-minute and 51-second The Making of Sinbad. This uses the traditional format as it mixes movie clips, behind the scenes bits, and interviews. 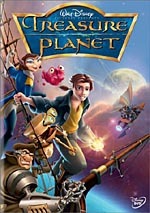 We find remarks from producers Soria and Jeffrey Katzenberger, directors Johnson and Gilmore, writer John Logan, actors Brad Pitt, Catherine Zeta-Jones, Dennis Haysbert, Joseph Fiennes and Michelle Pfeiffer, lead supervising animator Jakob Hjort Jensen, supervising animators William Salazar, Michelle Cowart, Rodolphe Guenoden, Michael Spokas and Dan Wagner, 2D effects supervisor Stephen Wood, composer Harry Gregson-Williams, and head of layout O’Beirne. Essentially nothing more than a long promo for the film, “Making” touches on a few production elements but explores none of them in any sort of depth. We get some story notes, info about the actors and characters, and different technical issues. These zip by quickly and tell us nothing, though they come with a lot of hyperbole. I always enjoy clips of the voice actors at work, especially when they include such big names. Otherwise, “Making” is a bust. Sneak Peeks presents a variety of real ads. We get a general promo for various DreamWorks animated DVDs plus a specific one for a new Land Before Time flick. Finally, this area features a trailer for The Cat in the Hat. In the Art Gallery, the stills split into five domains. We get “Characters” (nine screens), “Monsters and Creatures” (14), “Chimera” (10), “Journey to Tartarus” (five), and “Syracuse” (19). This offers a decent little collection, but it lacks much depth. Next we find some text components. Production Notes gives us some nice information about the film. The notes provide a decent look at a few important subjects and seem fairly rich. Cast and Filmmakers offers the standard biographies. As usual, DreamWorks pour on the listings. We get entries for voice actors Brad Pitt, Catherine Zeta-Jones, Michelle Pfeiffer, Joseph Fiennes and Dennis Haysbert plus directors Tim Johnson and Patrick Gilmore, producers Mireille Soria and Jeffrey Katzenberg, screenwriter John Logan, composer Harry Gregson-Williams, production designer Raymond Zibach, editor Tom Finan, head of layout Damon O’Beirne, lead supervising animator Jakob Hjort-Jensen, and supervising animators William Salazar, Dan Wagner, Rodolphe Guenodon, Serguei Kouchnerov, and Bruce Ferriz. The bios themselves don’t go much beyond the level of annotated filmography, but we sure do get a lot of them! As described on the disc, Cyclops Island “is an interactive feature where you can see a different adventure each time.” What this means is that at times, you can select to branch the story to follow different characters. It’s a short animated adventure that doesn’t seem like anything special, but it’s fun to have these choices. In addition, it uses all the film’s original voice talent, which gives it better production values than I’d expect. On the main menu, highlight the image of Spike and you’ll go to the “DreamWorks Kids” domain, where you’ll find a few extras. The Voice of Spike provides a 175-second featurette with comments from Pitt, directors Johnson and Gilmore, and animal trainer Boone Narr. We see auditions for the dog who’d play Spike and meet Harvey, the pooch who did the bulk of the work. It’s an insubstantial but cute program. In the Set-Top Games area, we locate three different contests. “Sinbad’s Sailing Adventure” splits into three mini-games. The first is forgiving but tedious. The second forces you to start over if you make a mistake and is mind-numbingly dull. The last one is absurdly simple. Unless you or your child are incredibly easily entertained, skip these; they’re some of the worst DVD games I’ve seen. ”The 3D Tour of the Chimera” isn’t really a game, but it’s vastly superior to the “Sailing Adventure”. You can waltz about the boat, see different compartments, and occasionally learn little tidbits. It should be fun for kids. The last “Set-Top Game”, “Save the 12 Cities” offers a simple matching game that requires no skill beyond decent eyesight. It comes with a reward: a shot from the end of the movie! Not much of a prize, since we can see that anytime we want. For a unique form of chapter search, go to Favorite Scenes. This splits bits into different themes like “Gross Out” and “Spike”. Within each subheading, you get a few choices of scenes that fit the topic. It’s a moderately interesting way to provide scene access. You find what you’d expect in Character Biographies. This provides short discussions of Sinbad, Marina, Proteus, Eris, Rat, Kale and Spike. These seem reasonably entertaining. For DVD-ROM owners, the fun continues. These come about in an odd way, though. Whereas usually DVD-ROM features pop up right away, you need to actually go into the “DreamWorks Kids” domain and click on “DVD-ROM Games and Activities” to access this stuff. Once you go there, you’ll find a mix of elements. There’s a “Sinbad PC Game Demo” that I didn’t try because I didn’t want to have to install it and muck around with it. “Spike Saves the Day” has you toss barrels at monsters. It lacks much point but seems kind of fun. “Reach the Realm of Chaos” seems less entertaining, as it forces you to ride air currents and avoid destruction. It sounds decent but becomes annoying quickly. “Grind the Granite Gates” is a little more fun, as you need to slide past various obstacles on a snow slope to avoid capture. “Marina Sails the Dragon’s Teeth” was another fairly basic obstacle-avoidance contest that mostly made me motion sick. Finally, “Printable Activities” includes a mix of things. It presents a book, an adventure game, a maze, some masks, a mobile, and coloring pages. All you need is a printer! A mildly entertaining but generally lackluster adventure, Sinbad: Legend of the Seven Seas never manages to rise a level of mediocrity. Uninspired and bland, it remains consistently watchable but never more than that. The DVD offers generally solid picture and sound plus a package of decent but unexceptional extras. This one might entertain the kids, but I can’t offer much of a recommendation for this so-so flick.